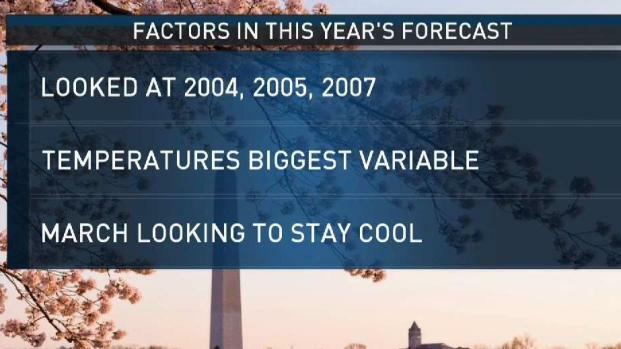 Friday's warm weather brought the cherry blossoms into stage two of blooming, the NPS said..
Warming weather is ushering in the start of blossom season, pushing the D.C. area into the next phase of Bloom Watch. 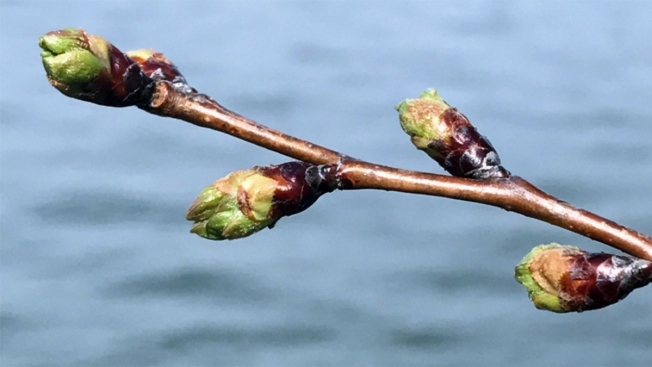 "Friday's warm temperature gave the cherry blossoms the boost they needed to reach stage two of the #BloomWatch - florets visible!" the National Park Service (NPS) announced on Twitter Monday. Next up will be phase three, the extension of florets, followed by peduncle elongation, puffy white and, finally, those two glorious long-awaited words: peak bloom. Peak bloom dates have been forecast for April 3-6, but the blossoms will be plenty beautiful long before then. In fact, flowering trees have already been spotted getting ready to bloom around the D.C. area. Peak bloom is officially defined when 70 percent of the Yoshino cherry blossoms are open, according to the NPS. Blossom fans tend to watch the weather carefully, because peak bloom dates and the length of the blooming period vary each year due to weather. The peak bloom dates are the NPS' best guess at when the blossoms will be in their prime. "As we say, if you can tell us exactly what the high temperature's gonna be every day from now until peak bloom, we'll hit it exactly on the nose. But, as your meteorologists know, it's not an exact science," NPS spokesman Mike Litterst told News4 recently. Check out NBC Washington's guide to all things cherry blossom season, including festival events and blossom viewing spots.